The Q-Ball phantom  consists of two several fiber strands formed by polyester fibers wound onto a spherical spindle. Between the fibers, the diffusing aqueous solution is located. In the two crossing points, the two fiber strands are either wound on top of each other, or they are interleaved by many changes of the winding direction (see figure below). This way, the restricted diffusion in fiber crossing in white matter of the brain can be modeled. This renders the Q-ball crossing phantom, for example, an important tool for verification of the correct resolution of fiber crossings in fiber tracking algorithms. 1. 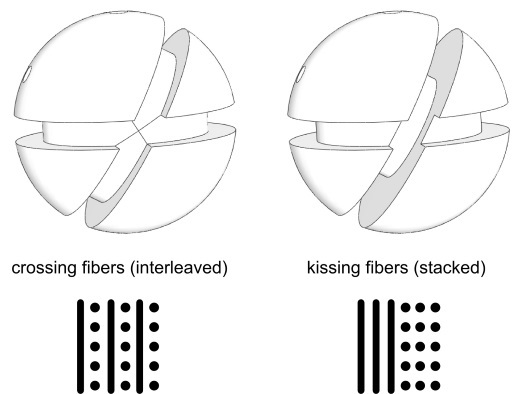 Interleaved fiber strands: During production, the two fiber strands are interleaved by alternating winding into the cutouts. 2. Stacked fiber strand: the fiber strands are wound after each other into the cutouts yielding so that they touch each other.